ASTANA – One of Kazakhstan’s foreign policy priorities is to pursue inclusive dialogue between leading powers to overcome “bloc thinking” and reach consensus on key global issues, new Kazakh Foreign Minister Beibut Atamkulov told ambassadors and envoys during his first meeting with the diplomatic corps in Astana on Feb. 7, according to the ministry’s press service. The meeting is an annual ritual to brief the diplomatic corps on foreign policy goals. “The main task of (the government) is to enhance the welfare and quality of life of citizens, as it has been defined by the President Nursultan Nazarbayev, and the responsibility of the Ministry is to ensure favourable external conditions for the sustainable socio-economic development of the country by political and diplomatic means,” the minister said. He also told the corps that developing multilateral and multi-level diplomacy is a strategic foreign policy resource. He said Kazakhstan continues to advocate for diplomatic solutions to conflicts and increased collective responsibility. Atamkulov noted Kazakhstan will continue to push for the meeting between global powers, such as the United States, Russia, China and European Union. 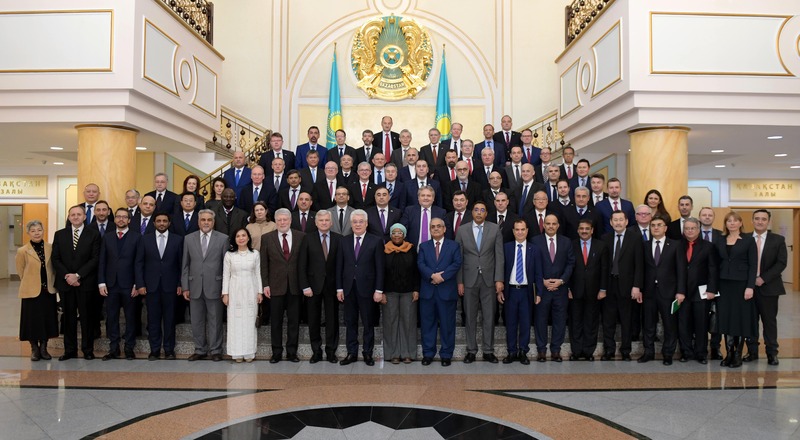 He also reminded the diplomatic corps of Kazakhstan’s nuclear non-proliferation and disarmament efforts and plans to open a United Nations Regional Hub in Almaty. He also noted Kazakhstan will continue to seek a resolution to the Syrian crisis through the Astana Process peace talks. The minister also noted that high-level events involving the Collective Security Treaty Organisation, the Conference on Interaction and Confidence Building in Asia, the Shanghai Cooperation Organisation, the Organisation for Islamic Cooperation and other major international organisations are planned for 2019. Kazakhstan will host in 2019 the First World Congress of Turkologists, the 12th Astana Economic Forum and the Fourth Meeting of Speakers of Parliaments in Eurasia, he said. The foreign minister also briefed the gathering on Kazakhstan’s priorities for interaction between Kazakhstan and individual nations around the world. The country will also continue to codify its historical and cultural heritage through the Ruhani Janghyru (Modernisation of Kazakhstan’s Identity) Programme and promote that heritage internationally. “We expect that cultural and humanitarian cooperation will become a significant factor in external relations,” he said. The minister also noted that Kazakhstan recently reached agreements with 20 countries on visa exemptions for general passport holders. These agreements are in addition to existing agreements with 45 countries allowing visa-free entry into Kazakhstan for up to 30 days, including all member states of the OECD and the European Union. Kazakhstan also launched Jan. 1 a pilot project to issue single entry visas electronically.